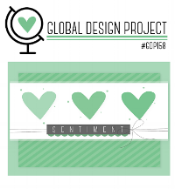 Last week the Global Design Project had a colour challenge. The week slipped away, and I didn’t get to participate. This week there is a sketch challenge. I really like the colours from last weeks challenge - Blackberry Bliss, Grapefruit Grove and Mint Macaron. They are 3 of my favourite Stampin’ Up! colours, so I decided to combine last week and this week and use those colours in this weeks sketch! Here is my card. I’m happy I got to use these colours together, they are a great combination. My background DSP is from the In Colour 6 x 6 DSP stack. I used the Sunshine Sayings stamp set for the flower, leaf and sentiment. This is a really versatile stamp set with some images and many sentiments that you can create by combining the words and phrases you get in the set.